WHEN Clement Chin began his military service, he was an obese recruit who could barely manage a single pull-up. Two years later, he is a fighting-fit soldier. And yesterday, he finally achieved his dream of becoming an officer when he was made a second lieutenant. It was a journey that took him from the training field to a backroom job as a storeman, before his gruelling efforts in the gym finally started to pay off. After beginning his Basic Military Training (BMT) two years ago, he had to be medically downgraded because of pneumonia. Surrounded by unmotivated storemen who saw their job as humdrum, the 22-year-old stuck out like a sore thumb. He trained hard at the gym after work, losing more than 12kg by going for daily 5km or 10km runs and even signing up for half marathons. "My hope of becoming an officer may have died and I was demoralised, but I did not want to slack off and still wanted to be fit," said 2nd Lt Chin. Eventually, his unrelenting grit and discipline started to pay off. He excelled in his second BMT attempt and qualified for the officer cadet course nine months ago. 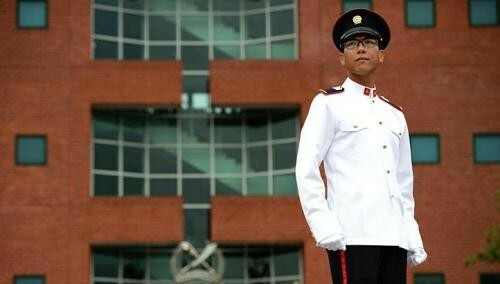 He even chose to extend his national service by five months, so he could fulfil his dream of becoming a Singapore Armed Forces (SAF) officer. Yesterday, 2nd Lt Chin won the prestigious Sword of Honour - given to the best of the 542 men who became commissioned officers after 38 weeks of rigorous training. He told reporters he weighed 90kg and could barely manage one pull-up when he enlisted two years ago. Now, he weighs 75kg and can easily complete 12. The logistics officer added: "It feels good to be fit but, more importantly, I had to be fit to be able to lead by example because people will be looking to you during the toughest training." Even though he has only six months left to serve, 2nd Lt Chin said he is going to continue to improve his fitness. He also hopes to motivate the logisticians serving under him by sharing his experiences. "They need to know that they are not just moving stores from one point to another, but are crucial for the army to carry on fighting and win the war," said the animation diploma holder, who is considering signing up with the SAF. Second-Lieutenant Heng Tao Han is also looking at a full-time career in the military. The 20-year-old air warfare officer, who received his commission yesterday, said he wants to inspire his men and unlock their potential. "It's about helping them to realise and maximise their strengths so that they can become an asset to not just the military, but also society," he said. Yesterday's commissioning parade was held at the Safti Military Institute in Jurong. Deputy Prime Minister Teo Chee Hean was the reviewing officer, while army chief Ravinder Singh and other top brass were also present. A slight drizzle did not stop beaming parents from whipping out cameras, craning their necks, and cheering their sons and daughters during the parade segment. Family members later fixed the rank epaulettes onto the new officers' uniforms. Mr Teo encouraged the young men and women to lead by example and act as mentors to their troops. "Ultimately, whether they respect you, trust you and follow you will depend on what you do, more than what you say. "Only then can you look them in the eye and ask them to put their lives on the line, and follow you into battle."